Nuclear medicine uses small amounts of radioactive material to determine not only the structure, but the actual function of organs and bones. This enables physicians to diagnose a variety of diseases, including many types of cancers, heart disease, aneurysms, thyroid problems, and irregular or inadequate blood flow. There are several different diagnostic tests that fall under this branch of medicine, each designed specifically to gather the information needed from the affected organ or system. A thallium stress test allows a physician to evaluate how efficiently blood flows into the heart heart during exercise and at rest. Any appointments before 10:30 am patients must fast from midnight the night before. For all other appointments patients should have an early morning light breakfast (no caffeine). All patients should abstain from consuming caffeine for at least 24 hours prior to their scheduled appointment. Please send our office a list of all medication you are taking, if any. Several heart and blood pressure medications could potentially interfere with the test results. It is highly recommended that patients consult both our office and their referring physician as to which medication can and should be avoided on the day of their test. Always check with your physician before stopping any medication regimen. We recommend that patient wear comfortable clothing (like a jogging suit) and shoes with non-skid soles. The test is designed to monitor the heart during and after moderate exercise. While walking on a treadmill, the patient is injected with a thallium contrast solution that travels through the heart and is scanned using a gamma camera to create a picture of the heart vessels and blood flow. After the patient’s blood pressure has lowered, more images of the heart will be taken. The patient should expect to be in the office for at least four hours. The results of your thallium stress test will be sent to your referring physician or cardiologist as soon as they are interpreted. It is the patients responsibility to contact their referring physician to discuss the results of their examination and ask for further recommendations. Patients should contact their referring physician in case they experience abnormal swelling, bleeding, fluid discharge, redness and/or a burning sensation in the chest, as these may be a sign of an allergic reaction. A bone scan is effective for identifying damage days or even months before it can be seen by a standard X-ray. Patients must first come to the office for their intravenous isotope injection and return three hours later for their scan. The patient will have to lay flat and remain still for the entire procedure which lasts approximately 30 minutes. 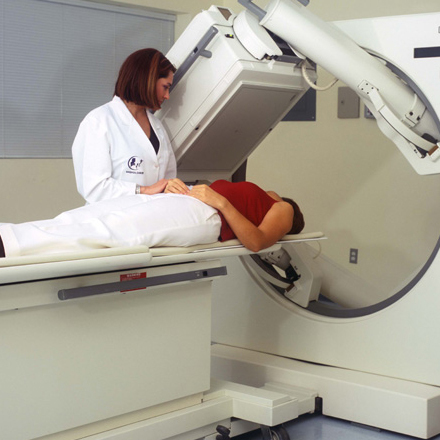 All of our diagnostic examinations are interpreted by Board-Certified Radiologists and Nuclear Medicine Specialists. A thyroid scan and uptake are two diagnostic tests that when taken together provided a complete picture of the gland. The scan evaluates size and position and the uptake evaluates function. 24 hours prior to the exam, the patient will come to the office to for the tracer. The patient must refrain from consuming any type of medication for thyroid problems and from consuming any food containing iodine, including but not limited to iodized salt. After accumulating in the thyroid for 24 hours, the tracer is released as energy. The energy release will be captured by a special gamma camera and transformed into an image with details about the structure and function of the thyroid. It is recommended that after a Thyroid Scan and Uptake the patient avoids contact with infants for at least four hours. The results of your Thyroid Scan and Uptake will be sent to your referring physician as soon as they are interpreted. It is the patients´ responsibility to contact their referring physician to discuss the results of their examination and ask for further recommendations.